When inputting the pharmacy code, be sure to enter “V-Go” or “VGo”. Note: a hyphen between the V and the G may be necessary. V-Go may be covered by a patient’s drug or medical plan. For details about filling a V-Go prescription, download the Pharmacy Information Sheet. The number for each option refers to the amount of insulin V-Go delivers at a continuous preset basal rate during a 24-hour period. 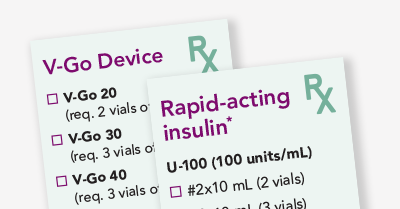 The amount of insulin available for on-demand bolus dosing with V-Go is the same (36 Units delivered in 2-Unit increments) for all three options. V-Go must be filled completely with insulin to work properly. A separate prescription for a U-100 fast-acting insulin is required for use with V-Go (2 vials for V-Go 20, 3 vials for V-Go 30 and V-Go 40). Dispense each as one (1) kit. Do not break apart. Each kit contains 30 single-use V-Go devices and one EZ Fill filling accessory.